As the United States and its territories begin their long resurrection from destruction to having basic needs met, it is important to remember that, with time, the full joys of waterside/coastal living can also come back strong. Island and coastal people are tough. Here on Long Island we didn’t need Hurricane Sandy (2013) to show us how much of a challenge Mother Nature can be. Our barrier islands regularly take a pounding. 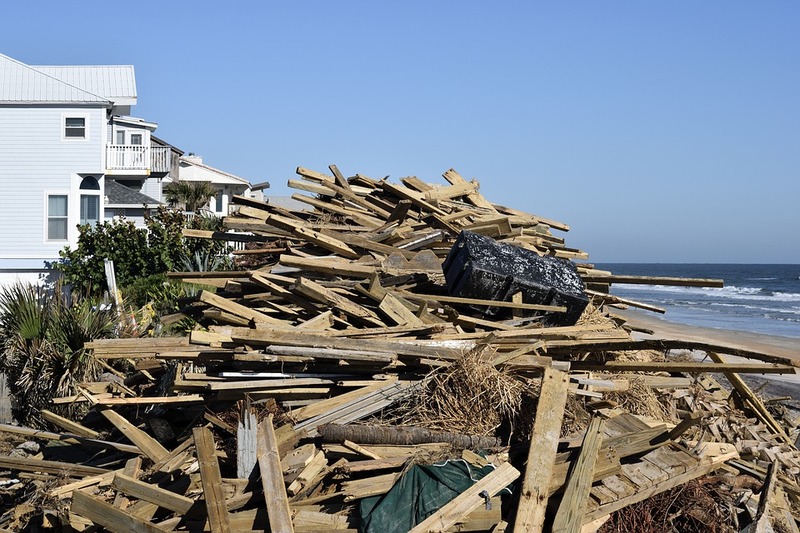 Beach erosion is an ongoing problem for counties and municipalities, as is rising sea levels. But we keep bouncing back. In addition to our prayers and donations, we wish all our citizens a full recovery — like ones we were able to be part of after Sandy. As an example, we’re sharing today a refurbishment by Deck and Patio that included a multi-level Trex deck and vinyl pool. 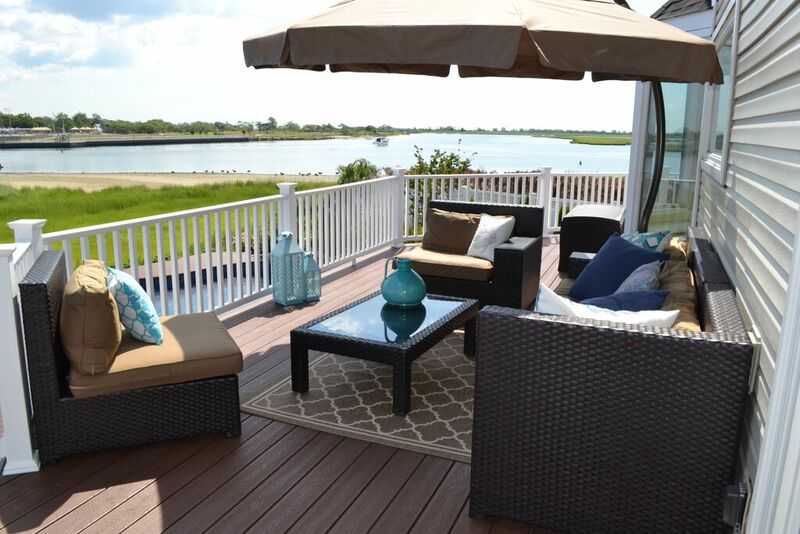 The owners of a waterside property — situated on a bay off the Atlantic in Bellmore, Long Island — were initially shaken by the loss of their outdoor living backyard amenities. After visiting the site, Deck and Patio was inspired to design/build a new 3-tier Trex deck and free-form vinyl pool to replace what was lost. 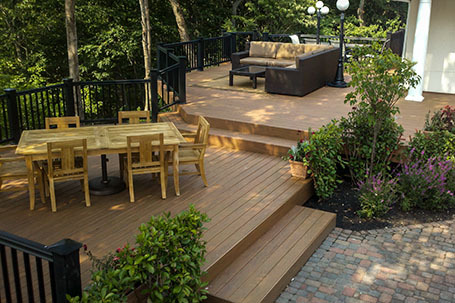 One reason we chose a composite decking material like Trex Transcend is not only does it hold up to intense sun, it won’t absorb water like natural wood will. Plus, Trex’s steel elevation framing provides an additional measure of security when strong winds hit. The backdoor of this home is set high above ground. In order to bring the outdoor space up to the same level as the home, Deck and Patio’s team divided the deck into three levels leading from the door, down to a new freeform vinyl pool and beautiful deck surround. Considering the vistas open to this home, maximizing them was an important factor in every part of our design. Facing in a different direction just steps from the seating area, level two of the new deck offered a custom outdoor kitchen/eating area. A new grill, refrigerator, and smoker/cooker were set within curved custom cabinetry with a raised bar that mimics the Trex decking. The white vinyl railing offers dramatic framing around the warm wood tone of the outdoor kitchen and deck. In order to bring the outdoor space up to the same level as the home, our design called for three deck levels leading from the door down to a new freeform vinyl pool. 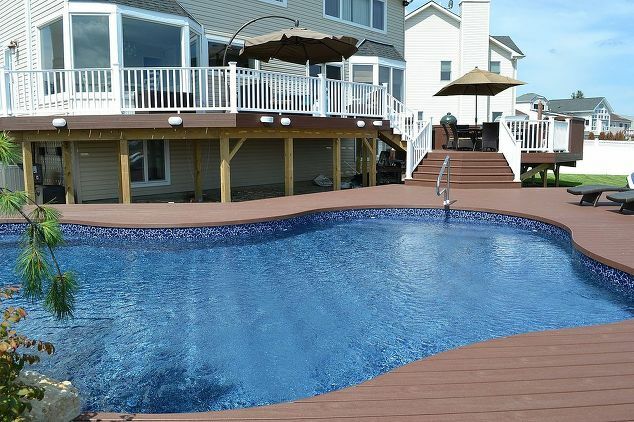 The Trex composite decking we used is a composite fabrication that eliminates cracking, rotting or splitting — perfect for waterside living. Trex requires no sealants because the composite materials are protected from UV rays; it also allows no damage from insects, water, or sun. Again, considering the beautiful vistas open to this home, maximizing views was an important factor in every part of our design. The pool is vinyl-lined; our design/build team added a Long Island boulder wall in front of some plantings to increase the natural look of the pool area; we also added a large custom diving rock. Deck and Patio’s prayers and hopes go out to all our fellow citizens suffering from these recent hurricane disasters. Whether you need to replace your old one, or you are starting from scratch, fall is a great time to build that new deck. Why? 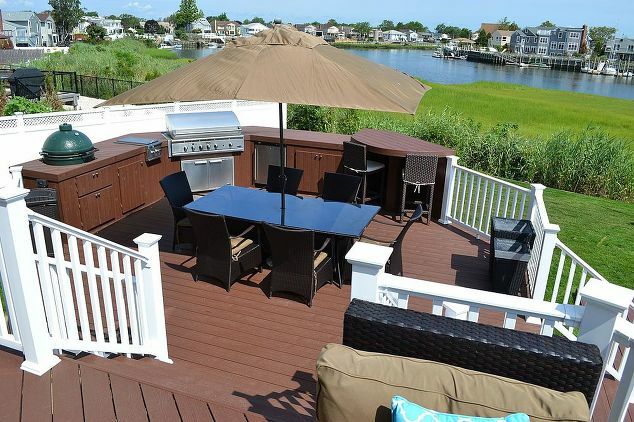 Because design and build firms like Deck and Patio have a bit more available time in their hectic schedules. 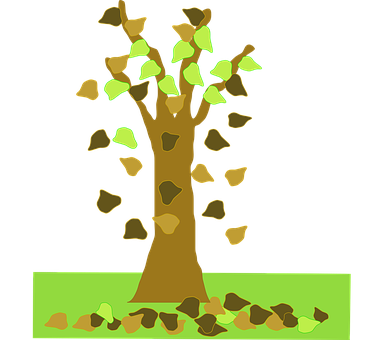 Fall weather is also usually very good, which allows for outdoor construction jobs to get done quickly. Plus, with the addition of a few special amenities like a custom fire pit, patio cover, and, perhaps space heaters, the outdoor season can be stretched far beyond early fall. 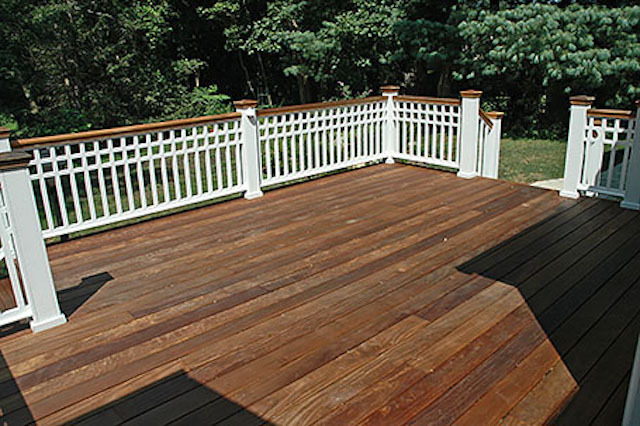 The structure of a deck is most often attached to the house. It’s usually elevated, that is, designed to suit the “lay of the land.” The land’s topography also helps determine how high and how many levels it should be. 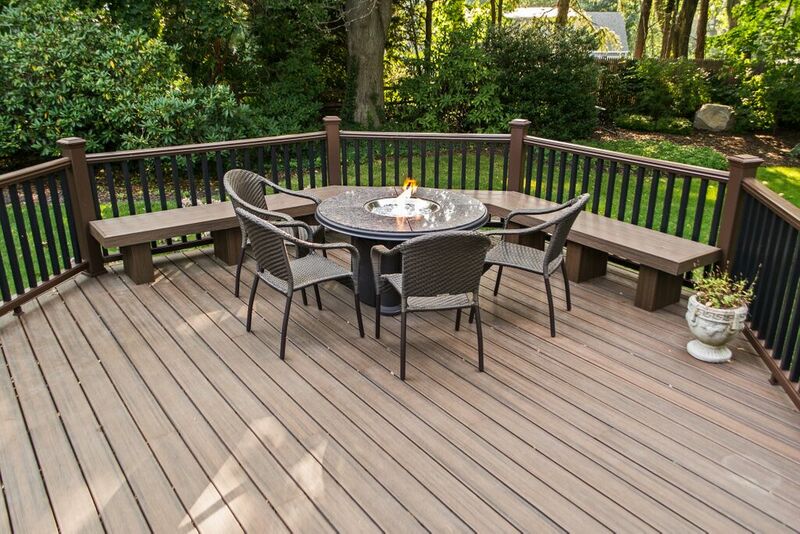 In addition to choosing the right design/build experts, the most important thing is choosing the deck material you want to use, i.e., natural wood, capped composite and pressure-treated wood. — Trex — Fiberon, etc. Of course, there are advantages and limitations to each of these. So, how to decide? To make it easier, Deck and Patio has built at our design center in Huntington Station an outdoor display comprised of a wide variety of these materials. Our experts are happy to explain the benefits of each. Here, you can walk on these installed boards, touch them, and get an idea of what they look like in sunlight. 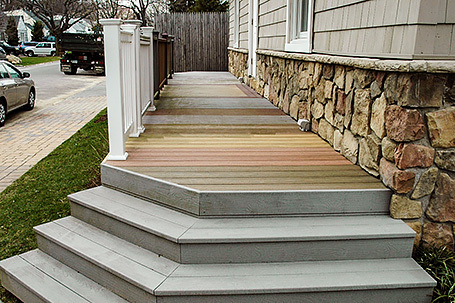 We believe this is the best way to get the information you need to start your deck project. 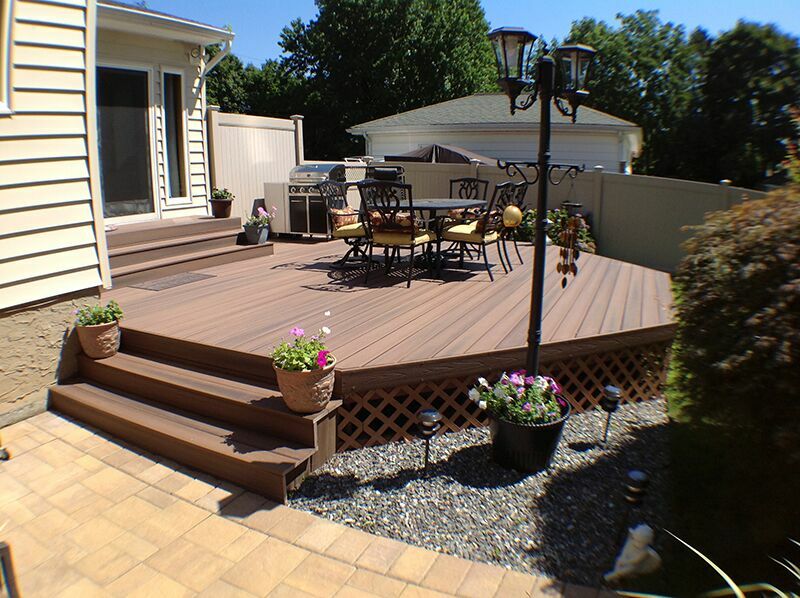 All of our decks are built to code, including concrete footings 36″ deep and 12″ diameter. 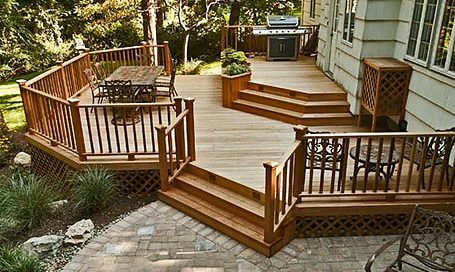 Our decks are designed to be safe and unique. 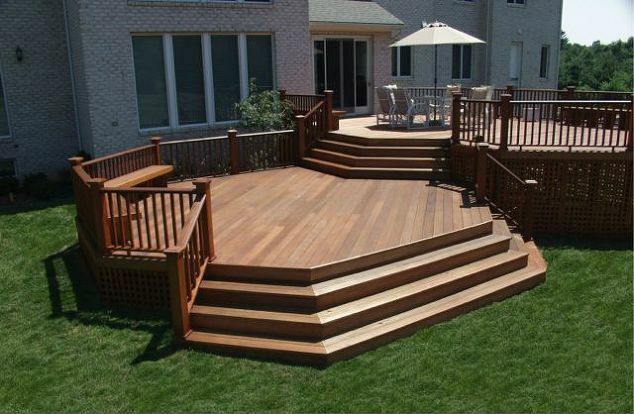 For those clients not wishing to go with the traditional rectangular deck, an angular (octagonal), rounded, or curved deck and rails can be designed to suit their outdoor needs. It’s weeks away. But as sure as leaf tannin stains decks and driveways, fall foliage is coming. 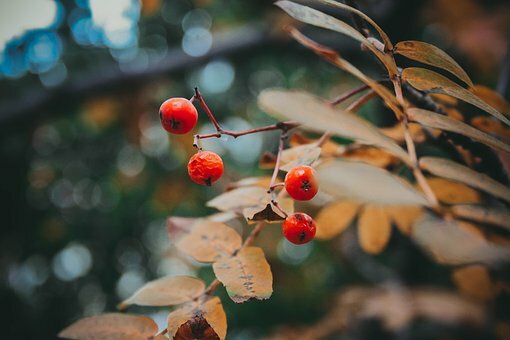 So kick back and give a few thoughts to some backyard maintenance that can be done now — and might make falling leaves less of a problem. 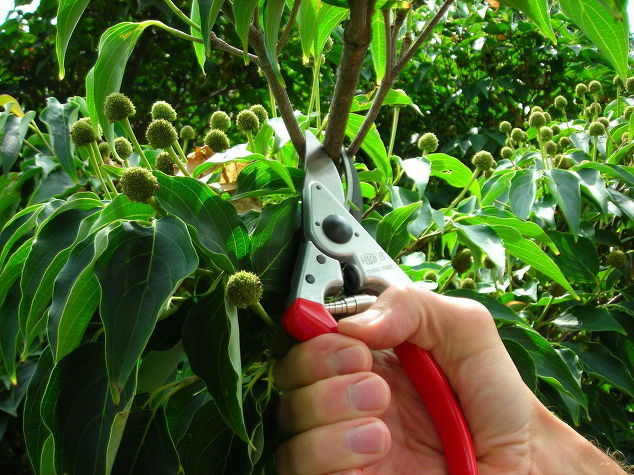 Right now — on the cusp of early fall — is the ideal time to prune. Cutting plants back now will give them enough time to callous over before the first frost. Without callouses, frost can cause them to die back or not bloom come spring. And we don’t want that. 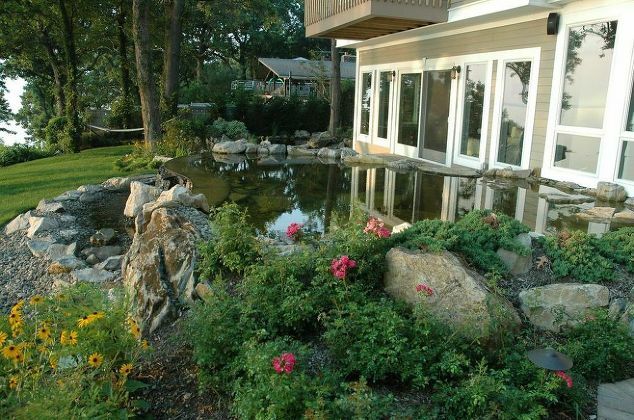 One area that needs a little care before leaves drop is the backyard pond. 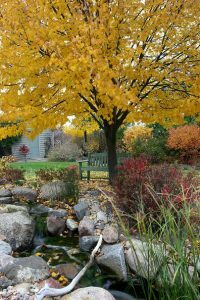 In a previous post, our blog covered in detail the importance of protecting pond water from falling leaves. 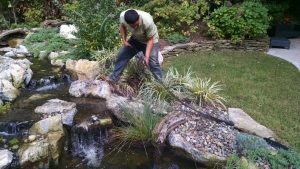 Pond experts at Aquascape Inc., a leading pond supply company, also suggest “tenting” the net so it doesn’t sag into the water when it becomes heavy with leaves and debris. They also say to trim back aquatic plants to reduce the amount of organic material decomposing in the colder months. A previous blog offers more details on water plants and how to care for pond fish in fall. 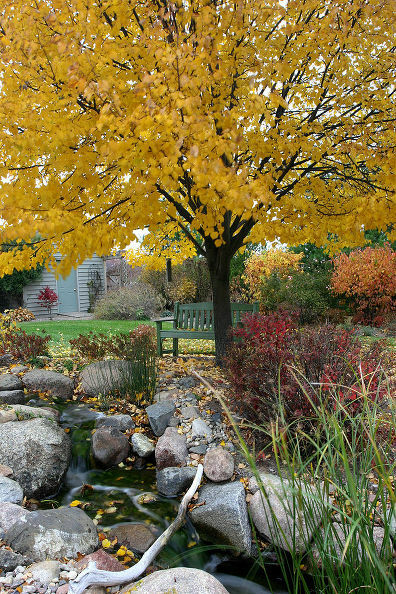 Photo: Courtesy of Aquascape Inc.
Before the leaves start falling off trees in your yard, check them out to see if there are any branches that do not have leaves on them. “This will tell you which branches might offer potential problems later down the road,” says Dave. To give plants a head start before spring, now, through the end of October, is a great time to be planting. Many of you will, of course, be thinking of planting bulbs for spring beauties like tulips, daffodils etc. But you can get all kinds of perennials in the ground now that will give you buds in spring, and color next fall/winter. 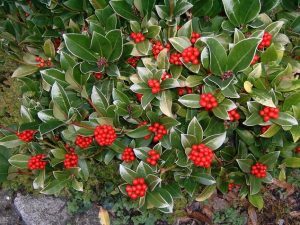 In an earlier blog, we discussed — Skimmia — along with other plants that offer color in the colder months. In spring these will give you vibrant white flowers; in fall, crimson red fruits (berries) that last through winter. A bit of effort in fall — before the leaves fall — brings big rewards come next outdoor season. Clean pond water, tidy and safe yards, blooming with color. When it comes to the outdoors, the best way to add value to your home is to renovate. 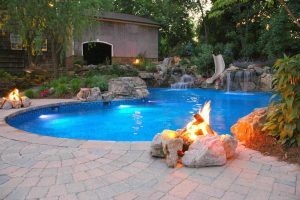 And since many people already own a pool, patio, deck or barbecue area, we thought pool closing season is a great time to consider value-based ideas to spruce up these areas. Whether or not you do any of these upgrades in early fall when closing down the pool, or whether you just discuss ideas for spring, now is a great time to think some upgrades through. 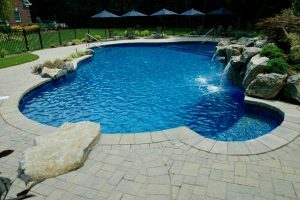 It doesn’t really matter if your pool is gunite or vinyl, there is one easy way to upgrade and save big money say pool experts. 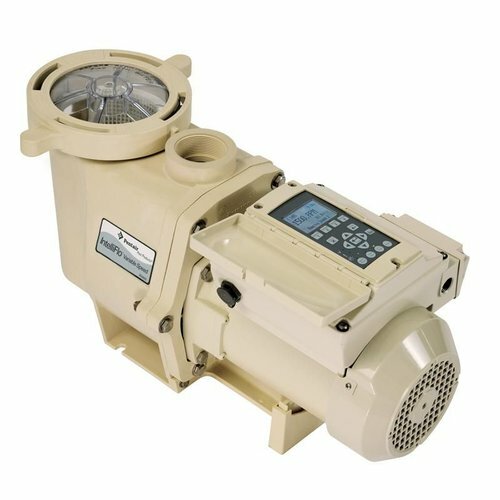 “Consider changing your current one-speed filter pump to an energy efficient variable speed pump,” says Dave Stockwell, owner of Deck and Patio. Other upgrade ideas would be to simply change the tile and color of your pool. 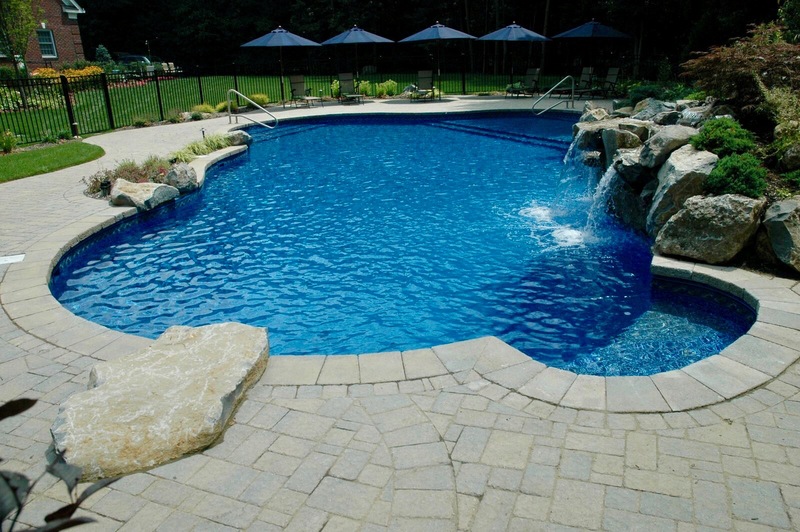 In gunite, there are many color options in marbledusts, pebble finishes and even all-tile pools. Also, you could upgrade the coping to make a fresh, dramatic statement. In vinyl pools, you can change a staircase, add a bench or swimout, change the coping — and of course change your old liner. Liner color choices are almost limitless and it is amazing what a new liner does to an old faded pool as seen in this photo (right). 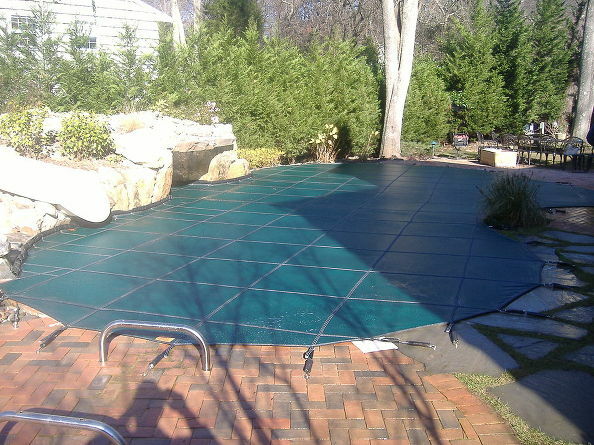 There are even pebbled colored liners in a tan tone that make them look more like a gunite pool. Renovating around a pool is sometimes easier than renovating the pool itself. It could be something as easy as fixing a settled or damaged patio. Other ideas might be upgrading to a new patio material like Techo-Bloc “Inca” pavers. Be sure to compact and install enough base to prevent future settling. Another popular upgrade is adding a slide and/or waterfall. Insist on a rubber liner under the waterfall to ensure that it will be leak free for a long time.